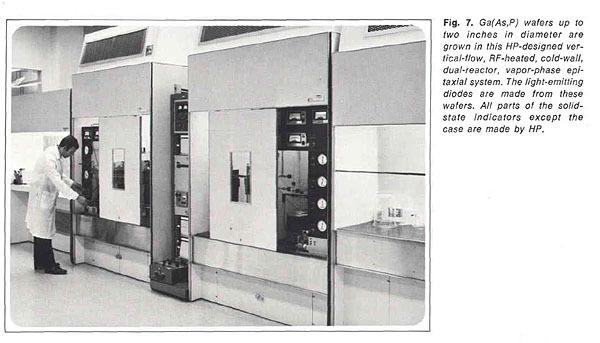 Hewlett Packard's 5082-7000, manufactured in 1969, is believed to be the first smart LED display (ie, a display that includes it's own decoder chip), to ever be commercially produced, as well as HP's first LED display. Hewlett Packard largely ignored the trends then current in IC fabrication and constructed the 5082-7000 in a hermetic metal bathtub package. 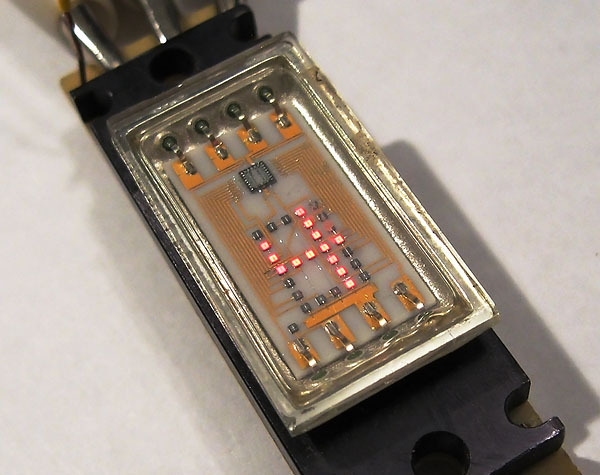 The digits in this device are somewhat stylized--each is equipped with an extra row of LED dies to allow for the generation of more natural representations of the '4' digit. 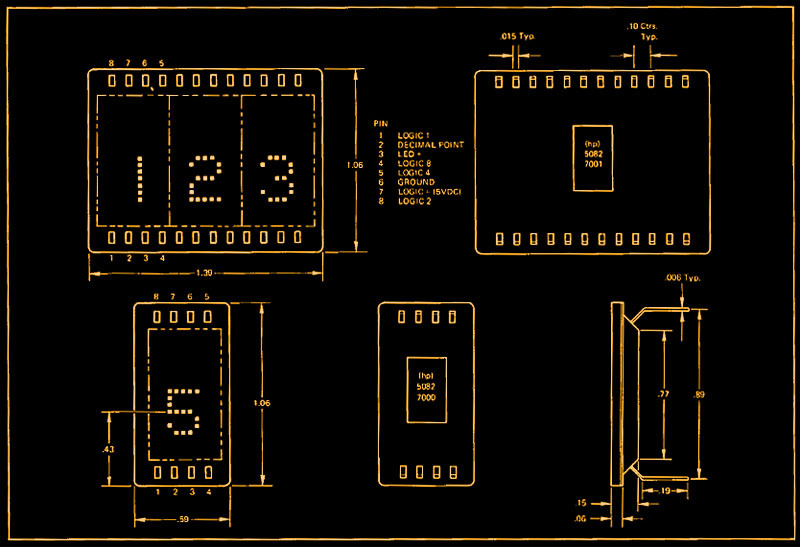 Very few displays offer this feature, as it significantly increases the number of dies necessary to display a digit. Each of the dies was placed by hand, with tweezers, by HP's team of assemblers. This helps to explain the display's original list price of $75 dollars per unit, a substantial amount of money for 1969. The display includes a built in BCD decoder, which is located above the displayed digit. 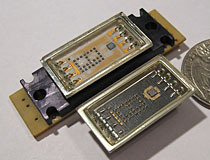 The leads of this device are attached to the metal can enclosure with glass beads and an internal ceramic substrate acts as a base for the display's internal gold traces. This display was made in both white and gray ceramic versions, the white version is shown here. Note the large metal heatsink mounted under the display, which dissipates the substantial amount of heat this device generates. The 5082-7000 saw use in a historically significant device, Hamilton's 'Pulsar' first generation LED watch. 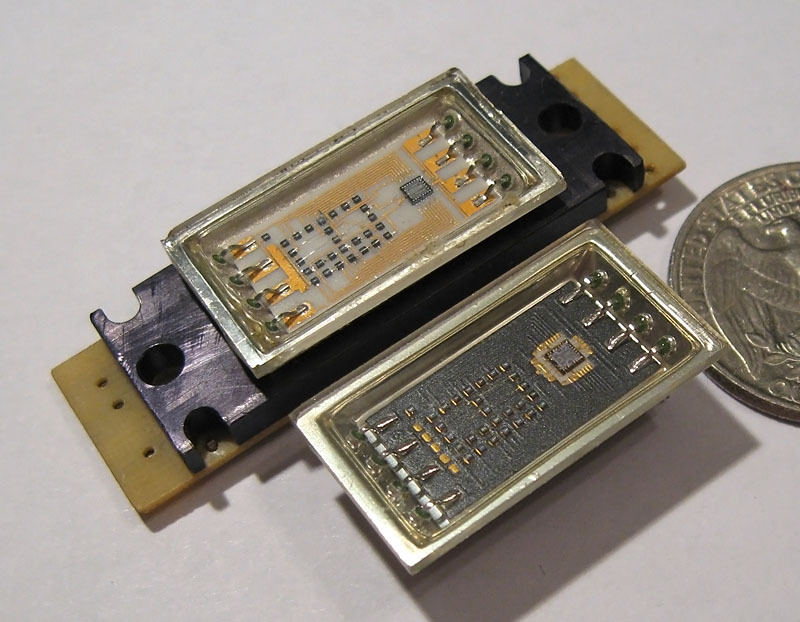 In order for the bulky 7000 series displays to be fit into the watches' casing, Hamilton had special reduced-size ceramic billets constructed by a 3rd party company, which were then sent to HP for installation of the LED dies and proprietary controller ICs. Hewlett Packard 5082-7000 smart LED display, normal operation. 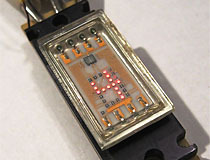 The earliest 5082-7000 LED displays were manufactured on a white ceramic substrate with later units utilizing a purple coated ceramic. Hewlett Packard 5082-7000 smart LED display, 10x magnification. 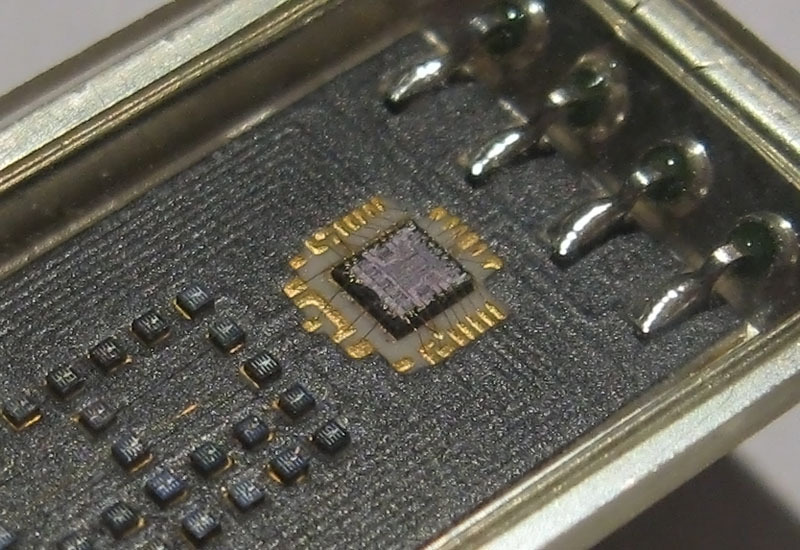 Note the comb-shaped top electrodes on each die; HP settled on this pattern because it would mask only 25% of emitted light while still distributing current over the entire die cross section. 5082-7000 pinouts and basing connections. Note that this display uses negative logic for its BCD input pins. 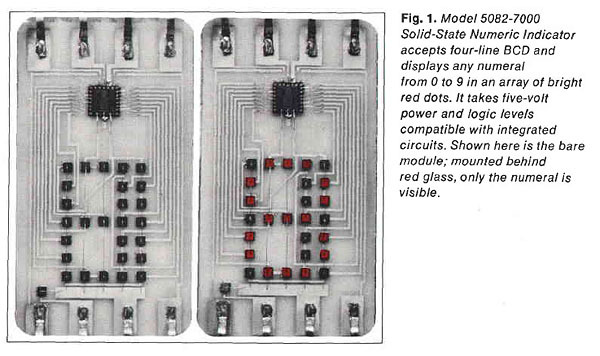 Photo from HP documentation covering the invention of the 5082-7000 smart LED display. This black-and-white photo shows the semiconductor fabrication machinery used to manufacture the LED dies in the 5082-7000. A cutaway diagram of the 5082-7000 LED. 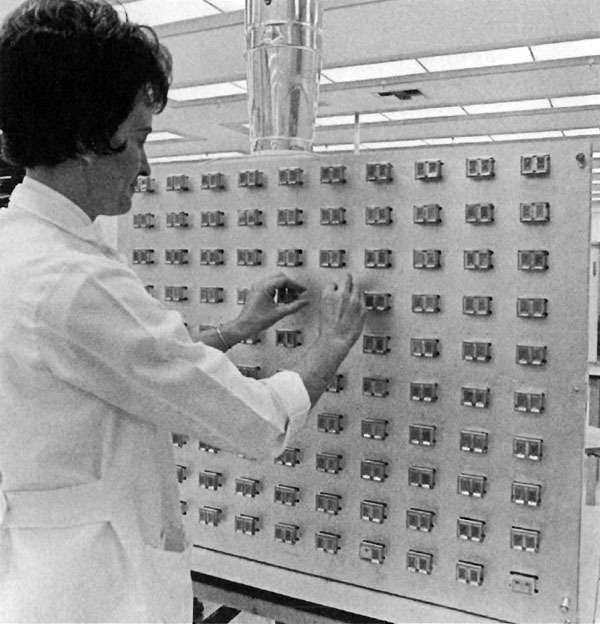 Prior to final testing and shipping, each 5082-7000 display was set onto an aging board, which exercised all of the diodes in the array for 100 hours. Each display had to maintain an acceptable level of brightness at the end of the 100-hour period or it was rejected.